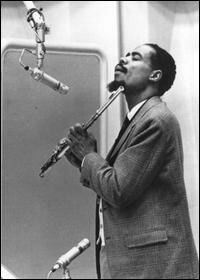 Eric Dolphy was a true original with his own distinctive styles on flute, alto saxophone, and bass clarinet. His music falls into the "avant-garde" category yet he did not discard diatonic relationships entirely; rather he used clusters of notes in less common ways. While most of the other "free jazz" players sounded serious in their playing, Dolphy's solos often came across as ecstatic and exuberant. His improvisations utilized very wide intervals, a variety of nonmusical, speech-like sounds and its own logic. Although alto saxophone was his main instrument, Dolphy was the first flutist to move beyond bop (influencing James Newton) and he largely introduced the bass clarinet to jazz as a solo instrument. He was also one of the first (after Coleman Hawkins) to record unaccompanied horn solos, preceding Anthony Braxton by five years. Eric Dolphy first recorded while with Roy Porter's Orchestra (1948-50) in Los Angeles. He had been enlisted in the Army for two years after which he played in obscurity until he joined Chico Hamilton's Quintet in 1958. In 1959, he settled in New York and was soon a member of Charles Mingus' Quartet. By 1960, Dolphy was recording regularly as a leader for Prestige and gaining attention for his work with Mingus. Throughout his short career, however, he had difficulty gaining steady work due to his very advanced style. Dolphy recorded quite a bit during 1960-61, including three albums cut at the Five Spot while with trumpeter Booker Little, Free Jazz with Ornette Coleman, sessions with Max Roach and an assortment of European dates. Late in 1961, Dolphy was part of the John Coltrane Quintet; their engagement at the Village Vanguard caused conservative critics to try to smear them as playing "anti-jazz" due to the lengthy and very free solos. During 1962-63, Dolphy played Third Stream music with Gunther Schuller and Orchestra U.S.A. and gigged all-too-rarely with his own group. In 1964, he recorded his classic Out to Lunch for Blue Note and traveled to Europe with Charles Mingus' Sextet (which was arguably the bassist's most exciting band as shown on the record The Great Concert of Charles Mingus). After he chose to stay in Europe, Dolphy had a few gigs then died suddenly from a diabetic coma at the age of 36. It was a major loss for jazz enthusiasts and the entire musical community.